There is one lady that we visit who looks around forty-two years old or so. She can’t speak, but she smiles so brightly when she sees us and through moans, we understand her feelings. She can’t walk and you can tell that she isn’t quite in control of her muscular functions. I don’t know what she suffers from, but her presence alone shames me for any time that I’ve ever felt ‘tired’ or ‘too busy’ to help out the fellowship. Her ability to smile, as if she had just heard the sixth number called out in the lotto drawing and looked up from an arm attached to a hand holding the matching ticket, is a tribute to Christ’s desire for us to live more abundantly (regardless of our infirmities.) She doesn’t get served communion, but our fellowshipping with her and singing makes her heart glad almost as much as it does ours. There are a few others that have unfortunately become regulars. One gentleman that we visit used to stand almost a foot taller than me when I used to see him in church services (and that’s not hard to do). Now he stays in a veteran’s hospital and he’s lost his sight. I remember how he played the harmonica for our congregation a few times. Now he’s in a wheelchair — head hanging down as if it weighed a hundred pounds. He probably doesn’t recognize my voice even though I took him home once. What I notice most about seeing him unfortunately isn’t the man in the wheelchair himself. The fact that he’s in a veteran’s hospital causes my mind to go back to all of the footage of Saving Private Ryan and other such movies as I pass the faces on the way to see him. I wonder about what each man must have seen with eyes that gaze back at me as if to say, “If you only knew, son. If you know knew.” Most of them kind of smile and nod when you greet them in kind with a showing of the teeth. But some are just staring off into the abyss. Thankfully these men all appear to be living in the twilight of their lives. However, I shudder to think that the average age of the men in those chairs will start to decrease if we continue on our current course as a nation. I say that there wasn’t anything about Joel — but in a small way, there was. Something about me distrusted the way that he smiled so often. 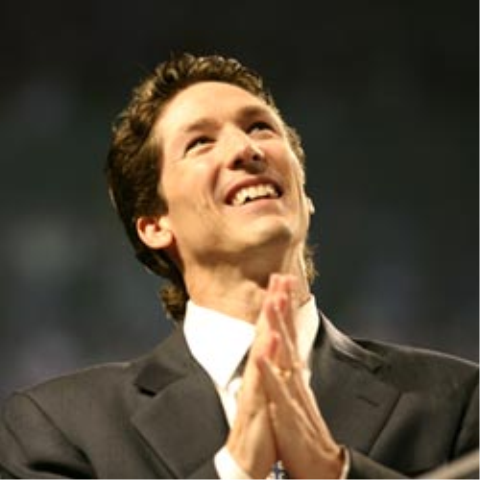 Something made me uneasy about the fact that the church was so large given all of the negative reports that I’ve heard over the years about others who have spent money exhorbently and bought excessively. I don’t have anything against mega-ministries, but I don’t encourage new Christians to join them. I feel that they definitely have their place. If more souls are brought to Christ, and more people are inspired to join smaller group where they learn more about the scripture, then they’ve certainly done their job. But a part of me feels like people join mega-ministries to become a part of something bigger….like the guy in Idaho who becomes a Yankee fan. Attaching yourself to success often makes you feel successful. About two months ago I picked up the original Rocky film on a special edition DVD. It sat on my shelf of “movies to be watched” for about….well…. two months. Surprisingly, as many times as it’s aired on TNT and other channels, I’ve never taken the time to real sit down and watch the entire film as it’s meant to be seen. 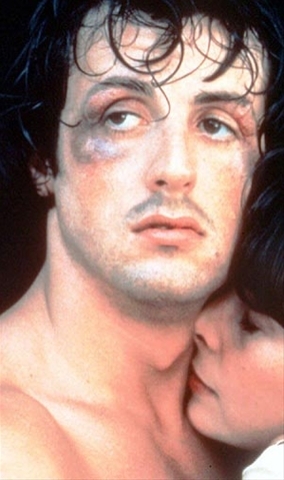 Like everyone else, I had seen so many scenes of Sly hitting meat in a frozen locker or yelling for Adrian after the fight in a pool of blood and tears. And who could forget the most famous scene in a sports movie ever — the morning run up the steps of the Philadelphia Museum of Art. Actually, I probably had seen the entire film — just in pieces. Like my own Tarantino director’s edition of Rocky. As I watched Rocky for the first time — I mean, truly watched the film — I was amazed at how much I had seen before, but didn’t actually see. The film opens on a shot of an image of Christ. OK, so no big revelation — lots of folks would get that trivia question right. But there’s something very significant about that opening image of Christ. In my eyes, there is a lot of Christ in watching Rocky in that early movie. For one thing, Rocky would bring honor and dignity to the city of Philadelphia, but much like Christ the savior who came to make all things new, those who saw Rocky before he entered into a rigorous training regiment didn’t see him as anything more than the tough guy in the neighborhood with the good heart. Never did they think that this would be the guy who’d go to Russia and for one moment get the world to stop thinking about the nuclear arms race and the U.S. vs. Russia and instead to focus on our humanity and what makes us alike as opposed to our differences. And all this time you thought this was only an anthem for extreme sports?!?! 🙂 P.O.D. came out with this gem back in 2001 and the video was released on that fateful Tuesday in September of 2001. Not only is the song uplifting, but the lyrics are inspiring. The group’s name, “P.O.D.” stands for ‘Payable Upon Death’. The meaning becomes clearer if you read 1st John 4:8 and then substitute that for the word, “love”. “And now that I know You, I could never turn my back away.” I hear you, fellas. I hear you loud and clear. What’s So Wrong With "Jesus Camp"? Some friends forwarded me information on an upcoming film called “Jesus Camp”. (I don’t want to comment much on the film since I only saw snippets — there may be balance within the film when viewed in its entirety.) From what I understand, the film shows a camp in North Dakota that is focused on Christian teachings and was probably chosen for the movie because they have practices that some may consider somewhat radical. When I first saw the above video clip, I watched it within a frame on someone’s page (as I presume you are doing here.) However, when I clicked on the actual YouTube link and look at the comments, I was pretty disappointed at what I saw. I already understand that people become really strong and brave when they are behind a keyboard and they express thoughts that they would never dare to express in your face. But I thought that to balance out the 25 comments to this movie that I’d find at least one Christian voice among them that would try to make some sense to the non-Christians of the video. But I didn’t see one. Not one among them. And so, naturally, I was persuaded to write my own comment. So, what exactly is so wrong and threatening about the video? I saw one image of children holding hands and praying. But of course that came at the very end of the video. Other images showed much earlier were of children crying against abortion and doing their own form of praise dancing — expressing themselves in an outlet that isn’t threatening to anyone. 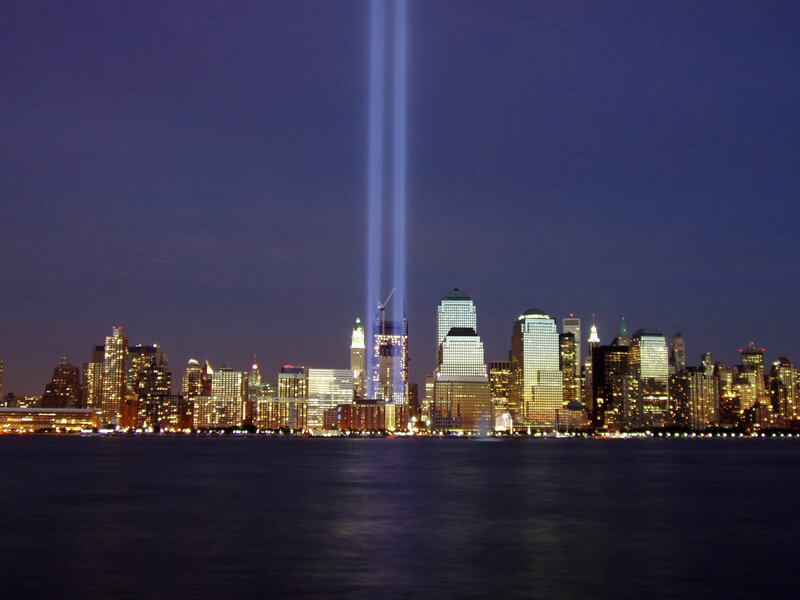 September 11, 2001 – My New Beginning…. I was riding home from church today listening to a radio spot in between innings of the Mets game. A bunch of random people were each quoting one line about where they were when the events of September 11, 2001 took place in Virginia, Pennsylvania, and, of course, New York City. “I was walking to class in Minneapolis”. “I was sleeping.” “I was taking my children to school.” Fortunately, I was a lot closer to the attacks myself. (Yes, I said fortunately.) I was about 6 blocks down the street. Walking distance. And although I went through periods of fear and post-traumatic shock (“Gee, I almost went to take a closer look. I could have been crushed“), I realized that I was right where God wanted me to be when those terrible attacks took place. To understand my story, you need to understand a bit about me first. Even though I’ve only been living for about thirty years, I’ve had a remarkable life. I think anyone who is blessed enough to be born in a country where you have access to education, an abundance of food, running water and all of the necessities (and some luxuries) of life has probably lived a remarkable life. (As someone I greatly respect always says, “It could have been the other way!”). Anyhow, with all that I had been blessed with, I didn’t necessarily grow up in a home where we knew God. Sure, we said grace when it was time to eat and we made our way to church for special occasions, but I would come to learn that we didn’t really rely on God the way that we really should. Every business day for five years since I had been working at my former company I generally didn’t reach the office before nine. Not necessarily because I was late. Working in technical help desk support, I was able schedule my time with a certain degree of flexibility. My first schedule was 12pm – 8pm (not by choice.) Later I would work a 10am – 6pm schedule for the majority of my nine plus years of service. There were only a few days when I would wake up earlier. Special meetings. Presentations. Client visits. But considering the stress and the rush of commuting in New York City from Queens to Manhattan, I enjoyed the flexibility and the lighter pressure of a shifted schedule. The client that I was servicing was due for a laptop upgrade. Each of that company’s sales reps would send in their machines and my staff would upgrade them. My client contact was from Chicago and she choose the week of September 3rd – 7th to do the upgrade. For some reason, she called me in late August and notified me she was moving the scheduling one week — from September 10th -14th. She flew in on Sunday and in an e-mail she agreed to meet me at 8:45 on Monday morning. I made it in at 8:40. But somehow she had already been to our office and was in our rollout room. I felt an incredible sense of disappointment in myself. Sure, I came earlier than we agreed, but business etiquette should have taught me to be waiting for her at 8am. It bothered me the entire day. Even though we agreed that day to meet at 9am, I made a personal commitment to myself that I would be there every day for the rest of the rollout no later than 8:20.